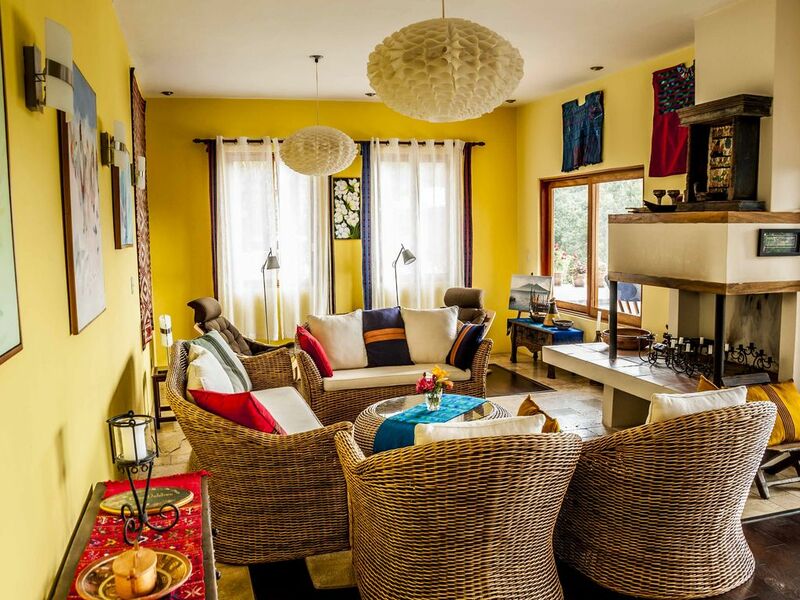 Casa Valdres is truly one of the most appealing private villas on Lake Atitlan. Accessible only by boat in the peaceful lakeside village of Santa Cruz, this 3-story 4-bedroom home is filled with light and ample space and offers some of the best lake views available. Extensive outdoor patio areas surround the solar-heated infinity pool, and the lush garden of tropical flowers invites a wide range of birds. Sweeping balconies offer panoramic views from the upstairs bedrooms and living areas, and the modern but homey feel of the interior makes this an ideal spot to relax in comfort. The incredibly spacious, modern kitchen is a dream for preparing simple meals or for lavish entertaining, with a huge island, double refrigerator, 6-burner stove, microwave and dishwasher. The equally large dining area seats 10 comfortably, and an adjacent living room with sofas and fireplace is a cozy retreat in the cool of the evening. High ceilings throughout the entire house add to the open plan and give a real sense of spacious elegance. WIFI is available throughout the house, and a DVD player with TV is here for further entertainment. A laundry room is also available with washer and dryer, and an elaborate filtration system including ultraviolet and ozone treatment ensures that all water entering the house is pure. Rental includes maid service twice a week, and gardener/caretaker is available daily. Behind the house are staggering views of the mountains. Our family of 6 (2 adults and 4 kids ages 17, 15, 13, and 11 years old) stayed in Casa Valdres for 3 nights. Everything everyone has already mentioned in their reviews is accurate...amazing views and garden. I was a little nervous about transportation to and from the house but Santos was readily available to arrange a boat ride for us. We requested that Dominga make dinner for us the evening of our arrival and breakfast outside the morning of our last day; the food was delicious!! The walk from the house up to the town of Santa Cruz for breakfast at CECAP was unique for our family from Chicago. This beautiful and comfortable home was a highlight for our trip to Guatemala. Highly recommend staying here. The villa was stunning with beautiful views and good access to other areas via boat. The gardens were some of the most beautiful and very spacious bedrooms. Santos was very helpful and informative. We didn’t see a cleaner however are unsure of whether this was due to us only having stayed for three nights. Thanks for a spectacular stay!! It's true...this property is paradise! Everything everyone has written about Casa Valdres in previous reviews is true. The house is incredibly comfortable and livable, the views are spectacular, the pool is beautiful, and the communication and responsiveness of the manager, Deedle, and the caretaker, Santos were impeccable. We could not discern very well what the layout of the house was by the photographs so here is a run down: There are five bedrooms - four have two single beds side-by-side to create a king bed (could easily be separated as they are made with twin sheets). The first floor has a large bedroom with it's own bathroom and a futon pull-out (about a double-sized bed). The second floor has three bedrooms - two with views of the lake. One of those rooms has a HUGE en suite bathroom. The other two rooms share a nice sized bathroom. There is a living room space on this floor. Climbing the stairs to the third floor you will find another bedroom with the best views of the lake. It has it's own private bathroom and living room. The second and third floor bedrooms have their own large verandas. The kitchen is well designed and well stocked with pots, pans, and cooking utensils. Just off the kitchen is a half bathroom and a laundry room. The kitchen table comfortably fits 10 people. The pergola with the outdoor fireplace/fire pit was where we had most of our dinners. Santos provided wood so we could cook and enjoy the fire in the evenings. Be aware that the climb to the house is challenging but probably doable for most - just take it slow and easy. Santos will help carry your things to and from the boat dock. There are a lot of stairs in the house as well. Walking along the shore to visit Santa Cruz (10 minutes) and Los Elementos Adventure Center/Lee Beal (20 minutes) were highlights. Our group (ages 6-66) rode in the back of a truck up the mountain - well past the village. It was a memorable and somewhat terrifying adventure! We kayaked and stand-up paddle boarded at Lee's. The boat captain, Andres Cumes - coordinated by Santos for various excursions to and from the house and other villages, was excellent. His boat is incredibly comfortable and clean. Per Deedle, coordination to the house from Kayucos Marina in Panajachel is simple. Just contact Santos with your arrival time and he will alert Andres - Andres will be there waiting for you. We did not arrive until late (almost 10PM) and they were there for us. La Torre supermarket in Panajachel was great for supplies. Incredible property with stunning views and excellent hospitality! I had high expectations for Lake Atitlan and Casa Valdres and it did not disappoint! My husband is Guatemalan and we live in the US. We booked this house during Semana Santa to vacation with my mother-in-law and my husbands family. It was also our first time bringing our son to Guatemala! The infinity pool and beautiful gardens were enchanting and we felt so relaxed there. Our toddlers loved the freedom of playing on the grounds. From the “lancha” boat ride to the property to the volcano views, everything about this place is enchanting. Santos, who is the caretaker of the property is just an amazing person and took care of our every need. He even was standing at the private dock one day as we returned on a public lancha and helped us carry up our provisions. I have no idea how he predicted our every need but the service he provided and pride he has for his country and his work really make Casa Valdres a 5 star experience hands down. We also paid approximately $20 plus groceries for a local woman to cook for us on the first night of arrival. We knew after traveling the mountainous roads all day with young children this would be a welcome reprieve. This was so perfect! The food was out of this world and healthy, and there were some leftovers as well which we enjoyed. Highly recommend this option for a meal or two depending our your group’s needs. As an American with Almost 100% Norwegian ancestry and my husband being Guatemalan American, you can imagine our delight and humor in seeing the Norwegian and Guatemalan flag together in the kitchen :). This trip was meant to be for our family. Only con with small children and my mother in law (whom is healthy but still 73) is all of the stairs both to the house and within the house. That being said we got our exercise in and thoroughly enjoyed our stay. We spent 5 days here at Casa Valdrez with our daughter and granddaughter. As we approached the house from the dock we were blown away by the amazing gardens. The infinity pool not only provided a view of the garden but also the volcanos and the lake. The outdoor furniture was very comfortable and the umbrellas provided were really needed as the sun is quite strong. The kitchen was stocked with more than everything we needed and the filtering system provided us with nice clean drinking water and ice. The bedrooms and bathrooms on the second and third floors were large and comfortable with absolutely amazing views!!! You will need to do some grocery shopping in Pana before you arrive because in Santa Cruz you will only have access to fruits and vegetables at one stand at the public dock. There are a few little restaurants by the public dock as well. It is about a 10 minute walk to this area from the house. Everyone we met was friendly and kind. We would definitely recommend this house to anyone who is looking for a tranquil vacation in a stunning setting. So glad that you enjoyed your holiday at Casa Valdres. Thank you very much indeed for taking the time to review the house. Hope to see you again in the future. We had a great stay at this property from the moment we arrived. Santos the caretaker arrived to help us with our bags and take us to the house. The house is fabulous with views of the lake from all levels and ensuite bathrooms. well equipped kitchen and comfortable living room all with great finishes and attention to detail. Lovely pool area to relax. Santos the caretaker was awesome and helped us with some hikes and a trip up to the local school and was most attentive to our needs. Definately a place for a family vacation for people looking for R and R as there is not much to do in the immediate area except relax and enjoy the beautiful scenery. Grocery shopping needs to be done in Panajachel so keep that in mind before you arrive if you plan to cook.Keep in mind that all other points of interest in the area are accessible only by boat which can add to the fun. Definately a beautiful tranquil spot away from it all! Thank you so much for your great review. Santos said that he really enjoyed being your guide as well! Sorry not to have met you but hope that one day you might return.